6 million people are stalked in one year in the United States. 1 in 6 women and 1 in 19 men have experienced stalking victimization at some point during their lifetime in which they felt very fearful or believed that they or someone close to them would be harmed or killed. Using a less conservative definition of stalking, which considers any amount of fear (i.e., a little fearful, somewhat fearful, or very fearful), 1 in 4 women and 1 in 13 men reported being a victim of stalking in their lifetime. The majority of stalking victims are stalking by someone they know. 66% of female victims and 41% of male victims of stalking are stalked by a current or former intimate partner. More than half of female victims and more than 1/3 of male victims of stalking indicated that they were stalked before the age of 25. About 1 in 5 female victims and 1 in 14 male victims experienced stalking between the ages of 11 and 17. Repeatedly receiving unwanted telephone calls, voice, or text messages was the most commonly experienced stalking tactic for both female and male victims of stalking. 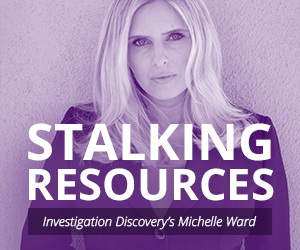 Criminal Psychologist, Dr. Michelle Ward, from Stalked: Someone’s Watching explains the different ways stalkers are categorized.